Recently we made a trip up to New Hampshire to take in some New England sites, and try out a range of Rosle Grilling tools. It’s a tough job here at Didriks, planning grill parties and relaxing in the beautiful summer weather, all in an effort to test out the merchandise, but someone’s got to do it! 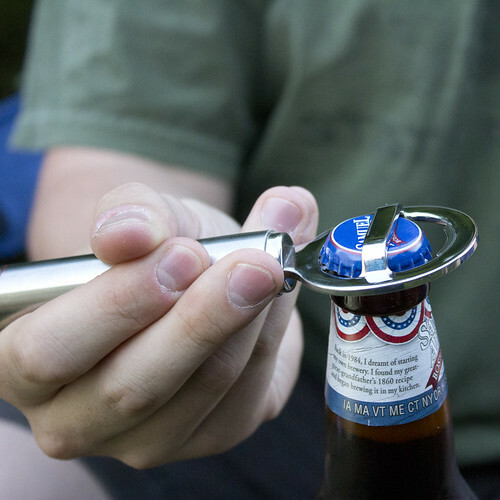 The products tested included a Rosle bottle opener, locking tongs, curved tongs, a grill fork, and a barbeque turner. Read on below for photos of each piece in action, and some notes on performance. There are few sounds in the culinary world more satisfying than the crack of caramelized sugar as you dig into a creme brulee. And there are few kitchen gadgets more exciting to use than the kitchen torch. So, we set out to make this dish that has a reputation for being something you order off prix fixe menus or while on vacation in Paris. But, like most French bistro food, it’s actually incredibly easy to make at home (once you get the hang of the torch) from basic ingredients you probably always have on hand. What keeps most people from making this delicious restaurant-style dessert is their lack of the necessary equipment. Because while the ingredients are common, creme brulee’s signature wide shallow ramekins and the essential sugar-caramelizing torch are not. For this whisk run-down, we tested Rosle’s range of whisks in everything from beating eggs, to whisking together sugar and cream, to whipping up a roux in a Mauviel pan. Rosle’s whisks have a sturdy handle that clearly differentiates them from cheaper whisks, where the wires are shoddily glued into the handle. The real mark of quality in Rosle’s whisks is the superior steel of the wires. It’s both strong and springy, ensuring that these essential kitchen utensils (well, at least some of them are essential) will mix well and hold up to whatever abuse you can muster, while you whisk muffin batter and meringue. This balloon-shaped whisk is by far the most popular kitchen whisk and you likely have at least one floating around your kitchen. It’s the multi-purpose whisk, but it really excels at aerating liquids, making light & fluffy scrambled eggs or thick whipped cream. Its shape also makes it great at blending dry ingredients. Because of its popularity, balloon whisks are available in innumerable variations of size and the number of wires and how dense the wires are. You’ll benefit from keeping a few in your kitchen for differently sized bowls.